India’s wheat production in the 2018-19 rabi season is expected to be 99.12 million tonnes, marginally less than 99.7 million tonnes last year, according to the fourth advanced estimates. Overall foodgrain production too is projected to fall slightly to 281.37 million tonne, as less rains brought down output. The country had produced 284.83 million tonne in the 2017-18 crop year (July-June), according to the fourth advanced estimates. However, according to the second advanced estimate of 2017-18, the foodgrain production in 2017-18 was 277.49 million tonnes. 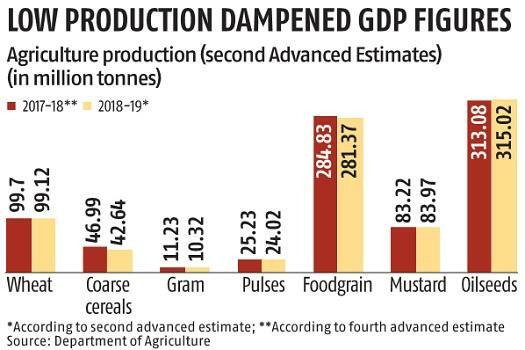 The low kharif and rabi production also pulled down the overall agriculture gross domestic product numbers, according to the second advance estimate for 2018-19. In the third quarter of 2018-19 (October-December), agriculture and allied activities grew at 2.7 per cent as against 4.6 per cent during the same period last year. For the full year in 2018-19, growth in agriculture and allied activities was estimated at 2.7 per cent, down from 5 per cent in 2017-18. 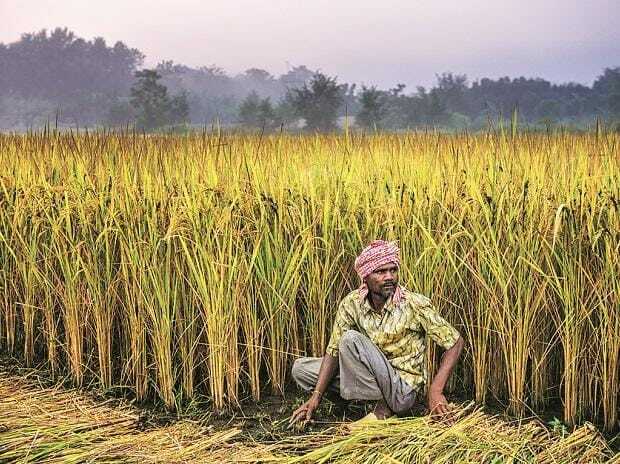 “Low monsoon and post-monsoon rains have pulled down post-kharif and rabi production, which is being reflected in the GDP numbers as well,” Madan Sabnavis, chief economist at CARE Ratings, said. Meanwhile, according to the farm production number, India is expected to harvest a lower rapeseed and gram crop in this rabi season, as the monsoon rainfall has been less than normal by almost 9 per cent. Thereafter, winter rains in October to December, which is critical for rabi harvest was 43 per cent less than normal. The production figures are subject to revision on account of more precise information flowing over time, the official statement said. According to the data, rice production is estimated to touch a record 115.6 million tonnes in 2018-19, from 112.91 million tonnes in the previous year. The production of coarse cereals is estimated to fall at 42.64 million tonnes from 46.99 million tonnes in the previous year. Pulse output, too, is seen lower at 24.02 million tonnes from last year’s record 25.23 million tonnes during the same period. Among non-foodgrain crops, total oilseeds production during 2018-19 is estimated at 31.5 million tonnes as against 31.3 million tonnes in the previous year. Sugarcane output is estimated at 380.83 million tonnes from 376.9 million tonnes. Production of cotton has been pegged lower at 30.09 million bales (of 170 kg each) from 34.88 million bales, while jute and mesta output is seen at 10.07 million bales (of 180 kg each) against 10.13 million bales. India has been witnessing bumper foodgrain, oilseeds, cotton, sugarcane, fruits, vegetables over the last few years, which has resulted in lower prices for farmers.